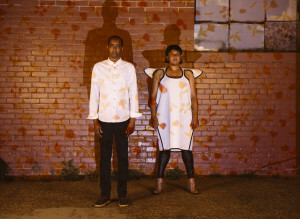 LAL is the Toronto Electronic duo comprised of Rosina Kazi and Nicolas Murray. The result of three years of studio work, new album Find Safety combines a myriad of influences, from Fela Kuti and Massive Attack, to Pete Rock and Detroit Techno. Lyrically, the album is informed by LAL’s community shows at its west end Toronto performance space, Unit 2, as well as Kazi and Murray’s passionate ongoing support of social justice causes and art projects, with an emphasis on Queer and/or BIPOC issues. The album overall addresses a need to create safer spaces for themselves and their friends, and musically is a masterful blend of synth and sample-based minimalism. Or as they prefer to call it, 4 a.m. music. Formed in 1998 by the dynamic duo of poet, lyricist, activist, singer and Bengali-rooted tough-guy Rosina Kazi and her life partner, producer, sound designer, philosopher, aphorismist and Barbados-born king of chill, Nicholas Murray, LAL always proved hard to describe. Their musical experience is wide with Murr having been a member of the seminal hip hop collective, da Grass Roots and designed sound for theatre and film, while Rosina has supported many of Toronto’s local music and activist scenes. They’re a band, but not only a band – they’re a music making magical mushroom, the visible flowering part of a much larger organism, connected with very fine but infinitely resilient roots. LAL is the flowering fruit of a complex network of microscopic filaments, these roots also belonging to other firms and organizations: incisive and relentless activist like No One is Illegal, ethical community based businesses like The Toronto Woman’s Bookstore or my performance company Mammalian Diving Reflex. We are one, huge, justice-hungry organism, a world-wide team of individuals, groups, organizations, companies, firms, NGOs, businesses, researchers, activists, philosophers and artists. LAL’s music relentlessly cuts a deeper and deeper groove, solidifying the same theme year after year after year after year: fairness will prevail. Rosina, as lyricist, recalls travelling to Bangladesh, her parent’s birth-place and experiencing the childhood trauma of seeing other children in destitute poverty. This vision was branded into her brain, the smoke issuing from the seared scar likely to haunt her and, in turn all of us, for the rest of our lives. If you have any doubts about this, please drop LAL a line and hang out with us; check out a party in our West End Toronto studio, search us out when we’re performing in Saskatoon, Lahore, Berlin, or Scarborough and get to know our crew of passionate people; determined folk who easily create work that is deeply ethical: magic mushrooms, all of us, connected and resilient and waiting patiently for the word to spread: there is no capitalist system, there is just us.